We are currently knee deep in finishing up the renovations for our little girl’s modern farmhouse nursery. She was born in May, so it’s definitely time for her to have a space of her own. So far, we’ve shared the inspiration for her modern farmhouse nursery, shown you some great options for white cribs and talked about what you really need when setting up a nursery. When I was looking for an area rug for our girl’s nursery, I found so many great options. Honestly, it was really hard to choose just one! So I decided to share some of my faves with you to give you some great ideas if you’re looking for modern farmhouse rugs. Wondering how to choose rug? Choose a color that contrasts with the flooring. There’s nothing worse than spending money on an area rug that doesn’t look much different from the flooring. Choose a color similar to your pet’s hair. Let’s talk about pets for a hot second, ok? Our furry little pets may be our best friends, but their fur can be the WORST. If you’ve got a pet that sheds (even a little bit), I’d recommend getting an area rug that is a similar color as their fur. For example, we’ve got a yellow lab, so I would never buy a dark colored rug. Even if I vacuumed it everyday there would be remnants of his fur. Mix a variety of pattern sizes. The pattern of your rug can really stump you if you’re having a hard time with how to choose rug. When mixing patterns in a room, it’s best to have a little variety of pattern sizes. So if your throw pillow has a small pattern and you have wall art with a medium sized pattern, you can do an area rug with a larger pattern. I’d recommend to avoid choosing all small patterns or all large patterns for your textiles and designs. How to choose from area rug sizes? When in doubt, go larger. If you’re right on the fence between two are rug sizes, choose the larger one. A larger rug will usually make the room feel bigger. It’s best to either have all of the furniture touching the area rug OR none of it. Again, when in doubt…all of the furniture usually looks better. Place your furniture in the room first and then measure for the best size area rug. If you don’t have the furniture yet when you’re choosing between area rug sizes, you can map it out by putting painter’s tape on the floor where furniture will go. Ready to see these gorgeous modern farmhouse rugs? Curious which farmhouse rug I chose for our nursery!? We got the Gray Print Dhurrie Ariana Rug and we LOVE IT! Which of these modern farmhouse rugs is your fave?? Do you have any more rug buying tips?? 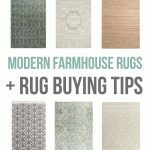 Modern Farmhouse Rugs & Rug Buying Tips – you are here! The blue nostalgia rug is my fave! These are really pretty. Excited to see your nursery reveal. Thanks Bri. I love that one too!